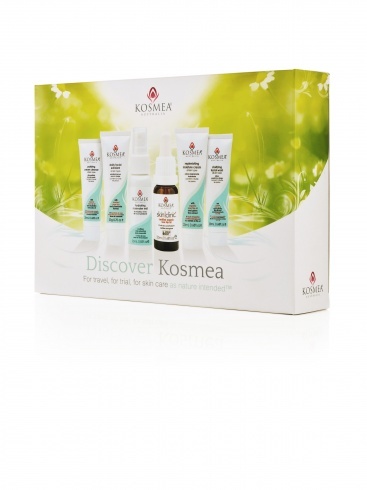 Recently I purchased a Discover Collection from Kosmea, RRP $39.95. The Discover Collection contains 6 mini products which are great for travel or if you just want to try some of their range before you purchase the full-sized items. If you order from the Kosmea website they have great deals where you can receive Free products and Free shipping. 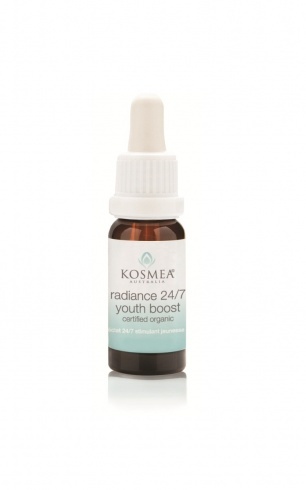 I was lucky enough to receive a free bottle of Radiance 24/7 Youth Boost 20ml RRP $39.95. Kosmea is an Australian Company which sells a range of organic skincare products which are all wonderful but a couple really stand out for me and I use them in my daily skincare routine. Radiance 24/7 Youth Boost and Hydrating Rosewater Mist are the products I would like to review today. Radiance 24/7 Youth Boost - this anti-oxidant rich oil contains Certified Organic; Rosehip oil, Seabuckthorn oil, Pomegranate oil and Camellia oil. Kosmea claim that this oil "Smooths fine lines and wrinkles, preserves the moisture and elasticity of the skin, revitalises the appearance of the skin and protects against the visible signs of skin ageing." Apply 2-3 drops to dampened clean skin morning and night. This is a non-greasy oil that absorbs right into your skin, it is best applied on dampened skin because the moisture helps the oil to absorb more readily. I have seen noticable results in the past three months since I have incorporated this oil into my daily regime. My skin looks healthier and I would have to say it DOES look radiant. The best recommendations of course are when others notice and tell you how well you look. I don't think I have used it long enough to see if it will slow the signs of ageing but it has certainly improved my skin texture so far. 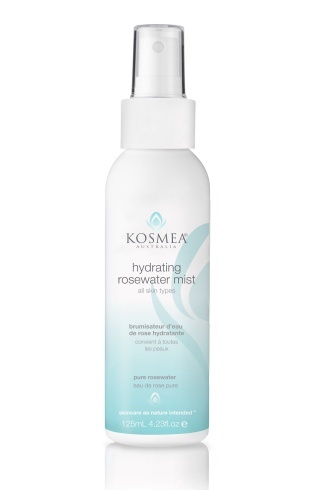 The other product I am really enjoying is the Hydrating Rosewater Mist Spray RRP $19.95 125ml. I use this product in conjunction with the Radiance oil after I have cleansed my skin. The added moisture helps the oil to absorb into the skin more readily as well as tightening skin pores. Smells divinely of Roses, cool and refreshing, this product can also be used to set make-up and refresh tired skin that needs a boost of moisture during the day. Particularly good spritz to use with mineral makeup, a couple of spritz really freshens your look during the day without adding more powder. I have already repurchased the full-sized Rose water, it is the best spritz I have ever used. I recommend Kosmea products to all who want a natural skincare routine which really works. Kosmea products are available internationally and they have wonderful deals on their website.